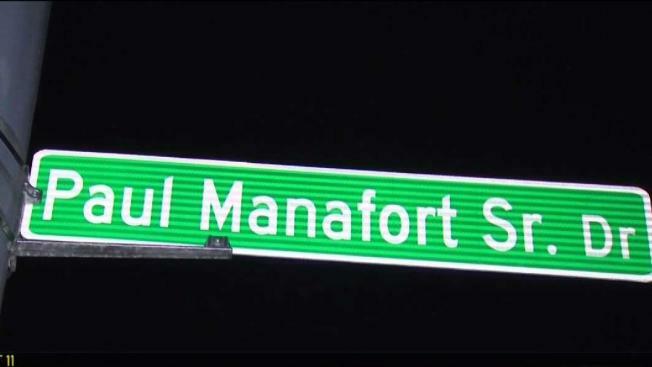 City councilors in New Britain have voted to change the name of a street that honors the father of Paul Manafort. Republican Mayor Erin Stewart last month changed the name of Paul Manafort Drive to Paul Manafort Sr. Drive, clarifying that it refers to the three-term mayor of the central Connecticut city and not his son, the former chairman of Donald Trump's presidential campaign who has been convicted of financial crimes. But Democrats on the city council say the name brings attention to scandals surrounding Manafort and have proposed doing away with it altogether. The council voted to rename the road Wednesday. In a letter urging the council to keep the name, eight members of the Manafort family said Paul Manafort Jr. has lived in Washington, D.C., for over 40 years and his problems do not have anything to do with the legacy of their patriarch, who died in 2013. Some spoke out against the name change, saying Manafort Sr. was a humble man who served his city and his country, and that's it's wrong to punish the father for the sins of the son. "Did Paul Senior do anything to warrant stripping him of the honor bestowed upon him 25 years ago? Certainly not," said Robert Smedley, New Britain's minority leader. The resolution proposed changing the street name to Ebenezer D.C. Bassett Way. bassett was a Connecticut native and alum of Central Connecticut State University, and the nation's first African-American diplomat. The proposal now goes to the mayor’s desk and she is expected to veto it. If she does so, the city councilors would need 10 votes to override it.